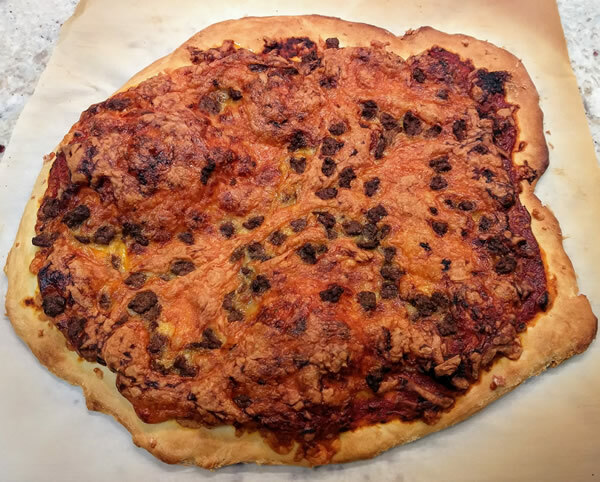 I’ve made pizza a bazillion times over the years, because as much as I love delivery pizza (especially if they have a garlic sauce), there is something special about making it yourself. Pizza dough itself is pretty simple – it’s just flour, water, yeast, salt, and olive oil. I guess you can stir in other stuff if you want, but I’d rather do all my extras on the top, instead of burying them in the dough. It should be a soft dough, but not sticky (if you do it by weight, you’ll likely get a perfect dough every time; if you do it by volume, like most American recipes call for, you’ll likely have to make adjustments to the amount of water and/or flour you use, each time you make it). I always make mine in the morning and stash the bowl in the fridge, so it rises slowly over the day. I’m a pizza purist – plain cheese pizza is always going to be my favorite – but I also do like other toppings from time to time. I’ve got a pizza stone, which is a lovely way to bake your pie because it provides the best amount of heat to really cook the bottom through, but I also have tiny little individual-sized pizza pans for when there’s a crowd over and we need to get a whole pile of pizzas set up quickly, or if we’re making up a batch to keep in the freezer for lunches or quick dinners later in the week. …and one with red sauce (which got a little overcooked, oops, because we weren’t paying attention). 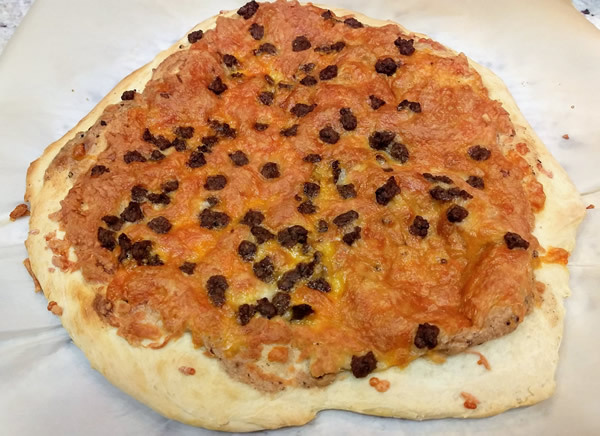 Both are topped with exactly the same thing – mozzarella, a sprinkling of cheddar, and some turkey sausage crumbles we had leftover in the freezer. And both were quite, quite delicious. 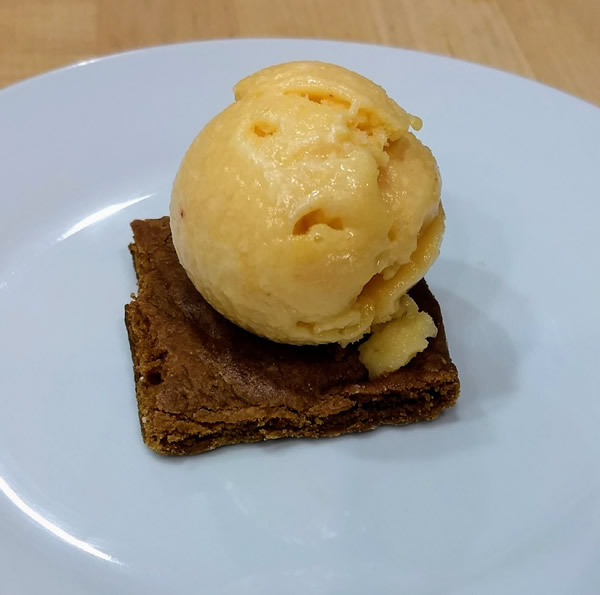 Also, it turns out leftover orange/peach frozen yogurt goes shockingly well with molasses bars. In case you were wondering. This entry was posted in Baking, Life. Bookmark the permalink.